The Black Scarabug docked far off the shore of Smuggler's Cove for two reasons; Marcilli and Felicia's old home was a five minute trek away, and docking in the main Krawk Island port still made Marcilli uncomfortable. Pirate Draiks were abundant in the area, but the chance of being found out made her wince. The Scarabug, after all, was simply the Kazeriu with black paint dumped on it and matching new sails. Though the appearance at a quick glance was menacingly different, an old Krawk Island merchant could easily wonder why the Scarabug looked so familiar. The entire situation was going off without a hitch until Felicia ordered, "Don't come with me." "I have to," Marcilli insisted. After all, someone had to act as a mediator for the doomed confrontation. There was an enormous chance that Marcilli's parents would not even be home, either on a new raid or cursed in new talismans. "I'm going to go pick up Elrique's supplies. If you're not back on the ship in a half hour, we're leaving without you." Marcilli would never consider leaving Felicia behind, but she had to find some way to threaten her. But the Tonu went unfazed. "Half an hour is all I need." That was a large amount of time for Marcilli, who was planning on taking fifteen minutes roundtrip to pick up a "payment" from someone that owed Elrique. The exact details were never discussed with her, per usual. "I have to meet him at the Golden Dubloon..." she waved a hand. "Whoever he is." "Have fun." Felicia had never visited the Golden Dubloon even when she lived on the island due to her young age. She waited bitterly for Marcilli to leave, afraid that the Draik would follow her. "And you... use rationality when you're talking to them. Ok?" Felicia bowed slightly. "But of course." With that, Marcilli gave a firm nod and left. As the Tonu's size became smaller, Marcilli walked away to the center of the island. Memories from her childhood crowded her mind. Though living in Brightvale was everything she could have imagined, there was something magical about Krawk Island. Even the packed Golden Dubloon, as dimly lit and crawling with unwashed seamen as it was, was a grand sight to behold. She slid onto a stool and was immediately graced with the Lupe bartender. "What'll it be, ma'am?" He flashed a crooked smile. Without a doubt he would have recognized Marcilli if her white skin had not turned a light gray. Marcilli chuckled. Grog was prepared one way and one way only, and any variations were not taken kindly. If the bartender was trying to pick out the locals from the tourists, he had a creative way of doing so. "No thank you." "Certainly, ma'am." The bartender nodded and went on to make her drink, satisfied that she was a native. "I recognize that voice anywhere." Who was speaking to her? Marcilli turned around to the familiar sight of a mutant Grarrl. She could feel her heart tear in half. Clauret's eyes were filled with vengeance. "I don't know what you're talking about..."
"Stop with the act. I know it's you, Miss Marcilli." She cringed. Was he really going to harm her? "You're mistaking me for someone else." "Merchants and pirates alike have been looking all across Neopia for the Silver Kazeriu. There is an enormous bounty on your head." "Is it her?" a voice chimed in. Marcilli could not immediately connect the voice to a face. "Indeed it is," Clauret answered without taking his eyes off Marcilli. There was no pickup that she had to do. This was all a set up. They were here for her. "Stand up," the Scorchio ordered. "Draw any attention and we'll make your time with us a lot harder." Marcilli saw him flash a gleaming dagger by his side, and she reluctantly obeyed. It was better than drawing attention to herself trying to escape, since the entire capacity of the Dubloon would instantly side with the likeable Clauret over her. The bartender set the mug down just as he caught sight of Marcilli leaving with the two other individuals. "Ma'am... yer grog..."
Felicia could not figure out how to categorize her current state of being. As she stood on the porch that led into the front door of her old home, she felt both anger and disbelief that she had ended up back here. Suddenly the flashback started up. It was the moment when Marcilli's mother brought her up the steps and into their home for the first time. She had been petrified to the bone. Thankfully Marcilli had been so kind to her and made her feel better. Now that years had passed, Felicia was no longer the young, naïve girl that barely accepted her staged life. She had comments, she had grudges, pent up until this moment that were igniting a fire in her soul. She was going to unleashed a venom of hatred. Felicia reached for the doorknob and was relieved to find it unlocked. She truly questioned whether she was capable of breaking down a door; she may have been a Tonu, but her strength of ramming things down had never been tested. The kitchen was the first room that Parlow had brought her into before Marcilli hastily took her back outside. It had gone unchanged, much to Felicia's surprise. She walked forward and into the living room that was connected to the kitchen. Murmurs were coming from the room, and she walked in on the pirates that took her life. Ahti and Parlow sat in adjacent chairs. Both were reaching from a nearby treasure chest, taking out the assorted jewels that filled the chest to the brim and inspecting them for value. A creaky floorboard pierced through the house as Felicia approached the corner, and the pirates snapped to attention. But their gazes softened as they saw it was Felicia. "Felicia... say it ain't so..." Ahti gaped. "We ain't seen ye in years," Parlow sighed dreamily. "Yer all grown up." The comments of endearment were the last thing that she wanted to hear. Felicia straightened her spine as her lips curled into a snarl. "Ahti, Parlow, I'm going to see my real father." The Draiks exchanged troubled glances with each other. "I know what he did to the both of you, and I know Elrique was behind it. Marcilli told me everything." "We still be in the process o' forgivin' yer cousin," Ahti muttered. "He isn't even my cousin. And you aren't even my real parents. If there's anyone around here that should be doing some forgiving, it's ME." "But we raised ye as our own!" Parlow protested. "We be the family ye'd ne'er have had!" "Raised me? That's the funniest thing I've heard in a while. Marcilli raised me while you two were out for months on end, looting ships and innocent people! I hope this very home gets raided so you can understand the travesties that you put people through!" "It be our job!" Ahti scowled. "This ain't a common place to be... no soul can know this be our home." "What must ye really say to us?" Parlow asked. It took every ounce of strength for Felicia to not attack Ahti nor Parlow. "You robbed me of my LIFE! Do you not understand?! You're acting so nonchalant about this whole thing! I was KIDNAPPED by you two! How are you still not remorseful about it?!" "Ye were on a ship all yer life," Ahti murmured. "No seein' the real world. We were gonna make ye a grand person who knew o' the life o' land." "My real father would have made me a better person! If it wasn't for Marcilli, I would be a savage with you two as influences!" Parlow's eyes began to water. A chord in her heart was strung. Whoever thought pirates were incapable of having emotions had never met Parlow. "That ain't fair, Felicia. That ain't fair to say at all." "I was going to be something great. But your ignorance prevented me from fulfilling an extraordinary life that I was destined to have." Parlow sniffled, clearly hurt by Felicia's ill remarks. "We did what we did to give ye an' Marcilli a good life. We risked our lives e'ry day to get rich so when it be our time to go, our girls be set wit'out us to provide fo' them." "We love ye like we love Marcilli," Ahti whispered. "Wit' all o' our soul." The endearing comments were not going to affect Felicia who raised a trembling finger. "You know that Marcilli is a pirate now? She's robbed and pillaged countless ships. And she looks just like you, Parlow." Parlow placed her hand over her heart. "That be a mighty honor." "It is no honor to be a pirate," Felicia hissed through clenched teeth. "The past months I have been on a pirate ship, and it took every bone in my body to act like I didn't want to kill them all. I couldn't even look at Marcilli when I found out she had become a pirate after all the time she spent teaching me to loathe them! Nearly every person in my life has turned into the enemy. All I have left to hope is that my father is not one of them. My real father." They said nothing in return. There was nothing left for them to argue about. "Good riddance to you ferocious fiends," Felicia muttered and turned to leave. The sounds of Parlow crying would be the last memory she would have of the Krawk Island home. Felicia exited the front door and found herself once again on the porch. She expected to leave and head for the Black Scarabug, but the next course of actions greatly shocked her. Felicia sat on the steps and sobbed. She did not hate them. She could not bring herself to despise them like she had assumed she was supposed to. And she hated herself for it. Felicia forgot how long she spent outside her old home. Eventually she had made her way back to the ship, boarding it to the sight of a waiting Arwman. Felicia scowled at the sight of the chief officer. "Extraordinary," she mumbled. "Are we setting sail anytime soon?" "Not until Marcilli returns," he remarked. Arwman was clearly upset by Marcilli's absence, more so than Felicia. "She said to be back in half an hour. It's been more than that." He stiffened his posture at the remark. He truly wanted to believe that she was all right and tried acting like nothing was wrong. "I am aware." "She said she was going to stop by the Golden Dubloon first to take care of business." "Something had to have happened there," mused Arwman. "Watch the ship, won't you?" "Hey..." Felicia watched as Arwman left. "I could be of help." Arwman entered the middle of town with his senses heightened. There was not a sign of Marcilli, and he could only think the worst. Upon entering the Golden Dubloon, Arwman recognized many of the occupants in the Dubloon, all rowdily helping themselves to endless food and drink. It was not his scene, though he would occasionally be forced to down rounds of drinks by Sicrax. "Excuse me," Arwman said as he approached the bar where a Lupe was handing out drinks. 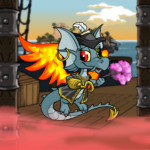 "Has a pirate Draik come by here at all?" "Erm, there be a lassie who ordered some bomberry grog not too long ago..." the bartender noted. "But she didn't drink it." The Lupe shrugged. "She was followin' two fellas outta here." Arwman immediately did not like where this was going. Marcilli was only supposed to meet one individual. Two sounded like trouble. "Who were they?" "I ain't sure, but one was a Grarrl. A mutant Grarrl, I believe," the bartender pondered. "Oh, I know! It be the merchant o' the Mystery Island route! Ol' Clauret! Shoulda known wit' that ol' black coat he adores!" "Clauret..." The name was spoken solemnly as Arwman exhaled. Clauret was not a bad guy... was he? "Where did they go?" "Ye got me," he pulled out a rag and began wiping down the countertop. "Ye know, now that I think o' it, the other fella was a Scorchio. Looked like he be lost on his way to the Lost Desert." Desert folk around these parts? That was clearly Cybin. And Arwman had an extreme hostility towards him. "Thank you for the information. It's all very useful." "No problem, mate. Best o' luck rescuin' yer maiden," the bartender tossed the rag over his shoulder. "She be mighty kind." "Er... thanks," Arwman could feel his face become red as he turned to push his way back through the crowd and outside. If Cybin was on the island, then Ulf was as well. The months before when Marcilli and the crew were transitioning to Elrique's Qasalan home, the captain had relayed every part of Elrique's life. Elrique was known as Winston to Ulf. Think... Arwman frantically tried to come up with some answer. "You must excuse this guest, Arwman," Marcilli purred at the Eyrie that was amused by the spectacle. "He's a wealthy individual that is accustomed to only greatness. He was recently spending his days renting out a suite at the Governor's mansion." "It was fit for a king... or anyone with ridiculous wealth." The Governor's mansion, of course! That had to be where they took Marcilli. And with that, Arwman ran off to help his captain. He just prayed that he wasn't too late.